The number of electric vehicles worldwide has risen to 3.2 million with 750,000 just in the U.S. With more auto manufacturers like Chevy, Ford and Nissan participating in manufacturing electric vehicles, Bloomberg reports almost every sixth car sold in the world will be electric by 2025. There are countless benefits you get from owning an electric vehicle including lower running costs, cheaper maintenance and environmental benefits. 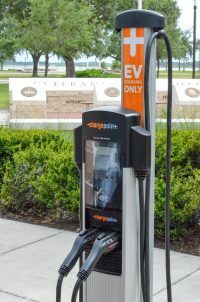 ChargePoint, the world’s largest electric vehicle charging company, reports that electric vehicle drivers save an estimated $13,000 over the life of the vehicle. It may also make you eligible for federal tax credits. With an increased demand for these benefits and more affordable models being released, it’s no wonder registrations rise every year. To keep up with this demand, charging stations are increasingly becoming available in local communities, including here in Kissimmee. If you own an electric vehicle, KUA powers a total of 18 charging stations in eight locations, with new stations coming in 2019. For the closest locations where you can charge, view our list of locations below. For more detailed information on station availability, what time of the day is best to go, pricing and more, you can download the free ChargePoint app from your smartphone appstore.